It has been officially announced that the fuel pricing formula cannot disclosed when it was inquired under Right to Information Act, says the Joint Opposition. 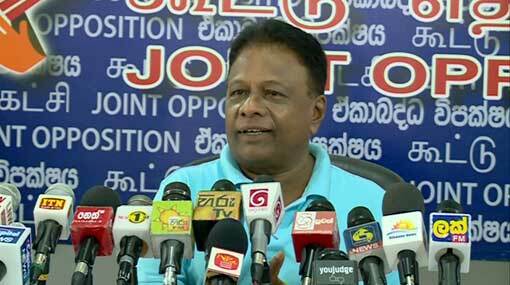 Speaking to the media in Colombo today (12), MP Dullas Alahapperuma mentioned this. Ministers of the government don’t know about the fuel price formula and according to Ravi Karunanayake this happens on the need of the International Monetary Fund, said Alahapperuma. He says that the question rises on what this price formula is and whether it is “witch’s formula”. In 2008, the price of a barrel of crude oil was USD 140 and if the price of a barrel increases up to USD 140 under the incumbent government, the price of liter of petrol would be Rs 295, points out the MP. If fuel prices are hiked monthly, there should be a parallel ‘salary formula’ for state and private sector employees, MP further said. The government launched a ‘poisoning mission’ against the Jana Balaya and he too was amongst the people who drank those milk packets, said Alahapperuma. Although media was not allowed in the premises where MP Johnston Fernando’s case was heard yesterday (11), however, contents of the case had been the main headline of a state newspaper, MP pointed out. The Finance Minister had conveyed regret on the diminution of Rs 18 billion from the taxes of tobacco companies and had pointed out that it was a great damage at the Cabinet meeting, says MP Alahapperuma.